When I first found out that I’d be teaching grades two through five, all in the same classroom, I’ll admit, I was a little nervous. It felt like going back to the one-room school house of the 1800s, only I’d have to meet all of them at their respective levels. Teaching a bunch of kids that are all within the same grade-level is difficult enough, nonetheless having four grade levels all within one room. However, over the past few weeks, my anxiety has softened, and I’ve realized that it truly isn’t much different than teaching a mainstream grade-level class. In fact, when I think about my last group, I was routinely instructing at reading levels ranging from third grade through eighth grade, and even within my math class, which had the lower and upper quartiles removed, I was still instructing anywhere from a fourth- to a seventh-grade level within any given lesson. But my biggest struggle with this current group wasn’t just the range of levels; it was finding a way to provide a common experience for the age range, yet differentiate within that common experience. Enter, design thinking. And lucky for us, we are blessed to be able to do such an incredible design project to fulfill that common experience. The project entails the children, sketching, prototyping, and designing their own furniture for the classroom, and the culminating component of the project is for the students to build the furniture themselves. 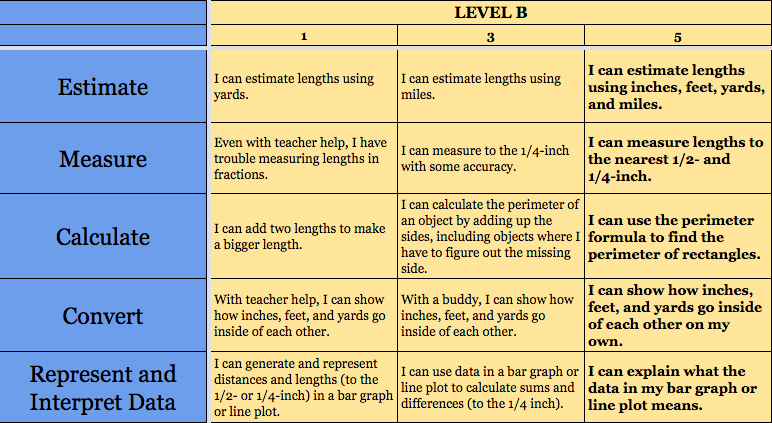 Naturally, this paves the way for a great deal of measurement skills, aligned very nicely to the Common Core Measurement and Data standards, ranging all of the aforementioned grade levels. So, I thought, great, we have our common experience. But then I came to another problem. How do I instruct all students at his or her own level, meanwhile capturing assessment data along the way and monitoring progress? Soon enough, the answer became easy. 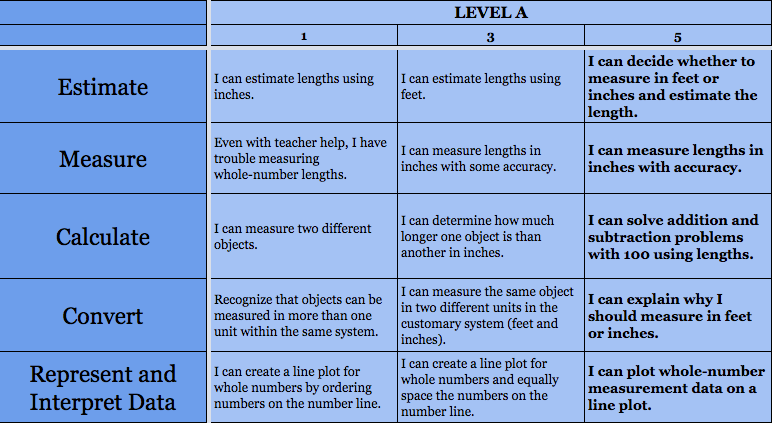 By creating a set of rubrics, ones that built upon each other, not only would I be able to align videos and small-group instruction to each of these rubrics, but I’d be able to assess each of my student’s progress along the way. Note, in the rubrics below, four grade-levels worth of skills are captured; however, due to the common strands that run through each rubric (Estimate, Measure, Convert, Calculate, and Represent/Interpret Data), I am able to place each student on a rubric commensurate with his or her level, and then progress monitor them accordingly. And tomorrow, I’ll tell you about letting them choose their own rubrics!